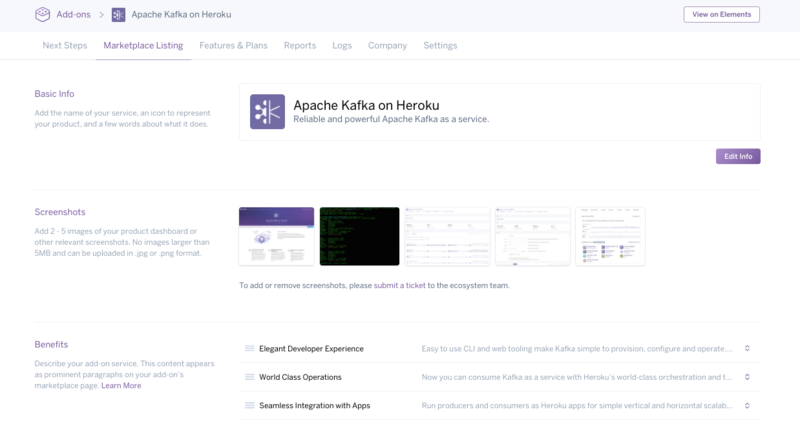 The new portal has been organized into a simple, elegant interface that is similar to the rest of Heroku's products. In each section, we've made more functionality available via the portal interface, where in the past emails or support tickets might have been necessary. This release brings a more visual approach as well as greater focus to creating and managing key aspects of your add-on offerings such as Marketplace Listing, Feature Plans, and Reports. The marketplace listing section of the portal is where you create or edit content for your add-on’s listing in the Elements Marketplace, where customers learn about your add-on offering. We've organized all the marketplace content into one tab of the partner portal for easier editing. We've also made it easier to re-order the paragraphs describing your add-on's benefits with a drag and drop interface. Coming soon: the ability to update your add-on's screenshots through the interface. We've simplified and made it easier for you to manage your add-on plans. We have categorized the different types of plans based on their availability to customers and you can view each type of plan in a different tab. The default view shows all plans. You can view and download your company's revenue reports from this section, in either PDF or CSV format. You can also view a chart of revenue by plan over time. If you're interested in becoming an add-on partner, you can learn more about the Heroku Ecosystem Partner Program. If you're already an add-on partner, login and get started with the new portal. Thank you to all our partners for making the Heroku Elements Marketplace a success! Please send feedback and suggestions to ecosystem-feedback@heroku.com.